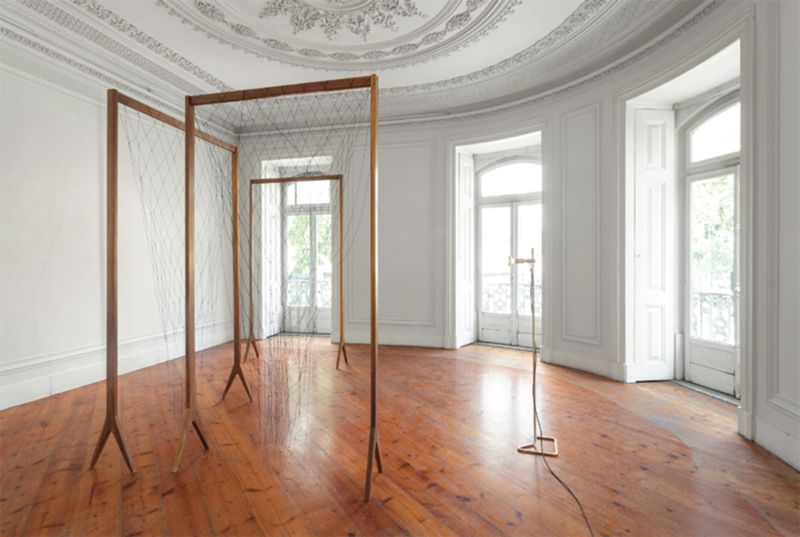 Leonor Antunes, the thread is so tiny that the eye, though armed with a magnifying glass, suspects it, rather than sees it II, 2013, agba wood, nylon thread, dimensions variable. Installation view. For more than fifteen years, Berlin-based Portuguese artist Leonor Antunes has focused on such concepts as measurement, memory, and site. She assesses the space where her objects will be installed and constructs them in relation to its dimensions, character, and history. But her exhibition at Kunsthalle Lissabon, “a linha é tão fina que o olho, apesar de armado com uma lupa, imagina-a ao invés de vê-la” (the thread is so tiny that the eye, though armed with a magnifying glass, suspects it, rather than sees it), seemed to represent a move away from this approach. Antunes did not draw on the measurements of the rooms at the kunsthalle, nor did the history of the space play any particular role in the construction of the exhibition. The ornamented nineteenth-century ceilings and oddly shaped rooms appeared to have provoked an emotional rather than rational response from the artist.